Validate is designed to answer a common question: What do the colors in a frequency RGB blend actually mean? 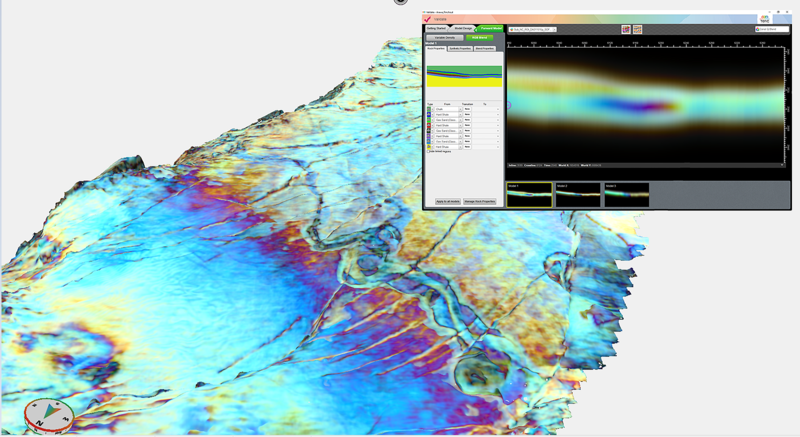 Combined with GeoTeric’s industry leading spectral decomposition and RGB blending, it uses interactive forward modelling techniques to investigate different geological scenarios to see how they influence the colors in a RGB blend. The result is greater confidence in the interpretation of the blends, in terms of bed thickness, rock properties and fluid effects. The Validate module is the result of a three year R&D consortium with industry partners VNG, Centrica (now Spirit Energy), Lundin Petroleum, BHP, and Eon (now DEA). GeoTeric’s R&D Director James Lowell said: “The consortium was a highly successful collaboration which has culminated in the development of new tool designed to solve operational problems. "The active involvement of the five consortium companies has ensured that Validate will help reduce uncertainty in a timely and efficient manner." Validate closes the loop in GeoTeric’s cognitive approach to seismic interpretation, enabling users to Reveal the geology, Interpret what they see, and then Validate the interpretation and subsequent model by comparing the synthetic seismic with the original data. Validate is available as a new module, compatible with GeoTeric’s 2018.1 release from 14th May. Find out more information about the latest release. 1. GeoTeric provides world-leading Cognitive Seismic Interpretation software to the global oil and gas industry. 2. GeoTeric’s cognitive approach enables you to see the geology before you interpret using software that is designed to work symbiotically with your natural cognitive processes. 3. GeoTeric directly translates geophysical data into geological information. With its patented data driven and user guided approach, interpreters explore for new reserves and evaluate reservoirs with greater confidence than ever before, while taking weeks out of their interpretation workflow. 5. GeoTeric is the trading name of Foster Findlay Associates Ltd - an independent UK company with offices in London, Houston, Newcastle upon Tyne, Kuala Lumpur and Perth.